In 2006 we retired from the Guest House we had upgraded and run for over 21 years. We had been looking for a project - a house needing work - and we found it here. We offered for the house in July 2006, took possession in September 2006 and had a race to get enough habitable by January 2007, moving time. The first task was outside - to get the property free from the climbers, ramblers and trees which were eating into the fabric of the house, shading the daylight and encouraging all forms of beasts to share the house with its owners. 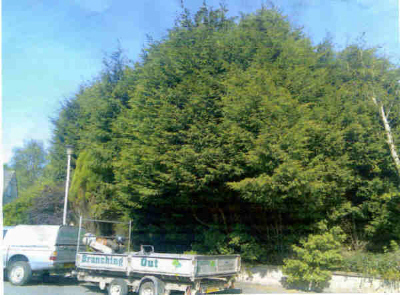 49 large trees and all manner of smaller climbers were cleared from the site. At last we could see the house and frontage. As ever, the best laid plans sometimes fail. 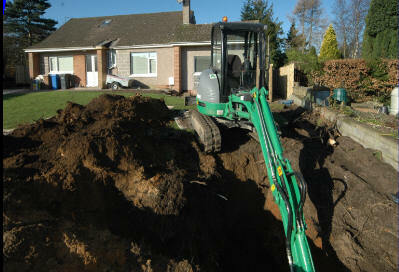 Not long after we had put down the turf for the front lawn we found blocked drains - so 25% of the lawn had to come up again to repair a broken pipe, probably the result of all those tree roots. At any rate we found where the main water feed to the house ran and also the plunger point that had been buried under the soil.